The electronic musician hid copies of the album all over Manhattan on Thursday in a pattern that, when viewed on the map below, spelled out the record’s name: Hèloïse (also the name of Wall’s late mother, to whom the recording is dedicated). 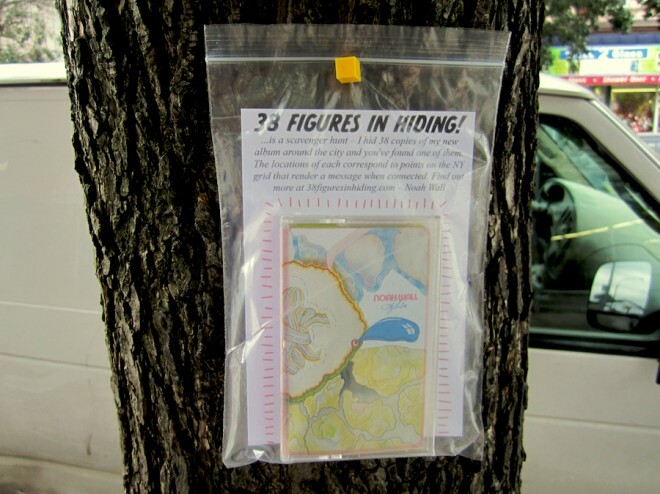 “A scavenger hunt seemed like a good way to distribute the music to both unsuspecting passers-by and people who had accessed the website/map I made for the project,” Wall told Wired.com in an email. The campaign, inspired by John Baldessari’s California Map Project, is a very clever way to use the web to get people to go out into the world in search of Wall’s music. Check out Hèloïse in the Bandcamp player above and find out more about Wall’s 38 Figures in Hiding scavenger hunt on the project’s website. Manhattanites, you’ll need to hit the streets soon if you want to find one of Wall’s records before they’ve all been hunted down.